John Blair from Blair Photography did such a beautiful job on these photos. He captured every single detail and special moment, and we're totally swooning over these! 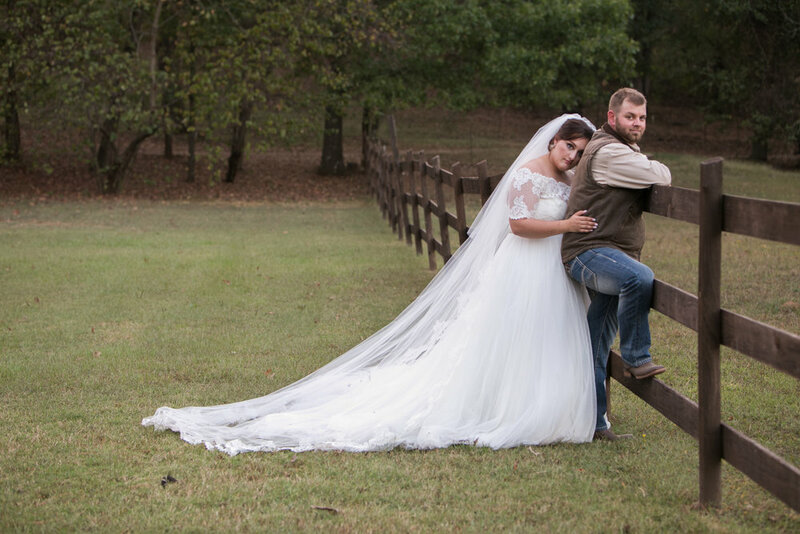 Abigail and Ben were married at The Barn at Twin Oaks Ranch on October 14, 2017. 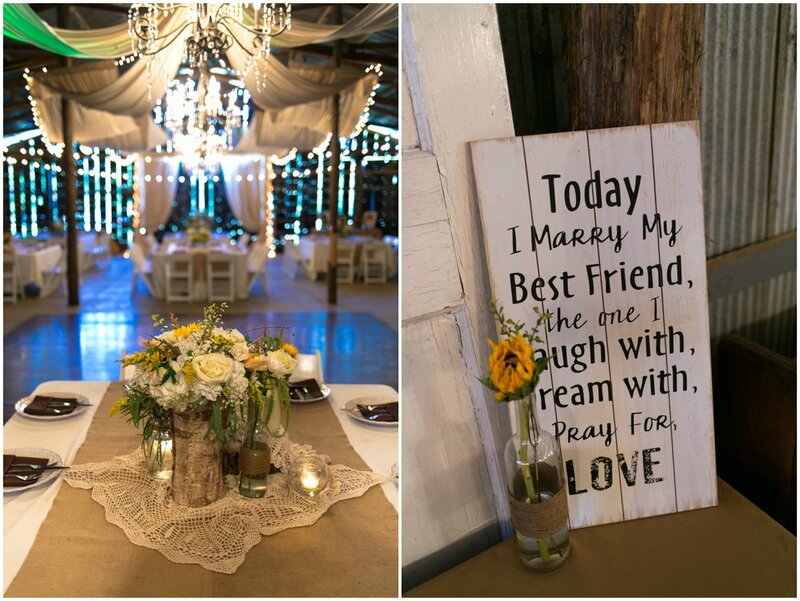 Their colors - white, yellow, chocolate and tan - were great for a rustic fall wedding. 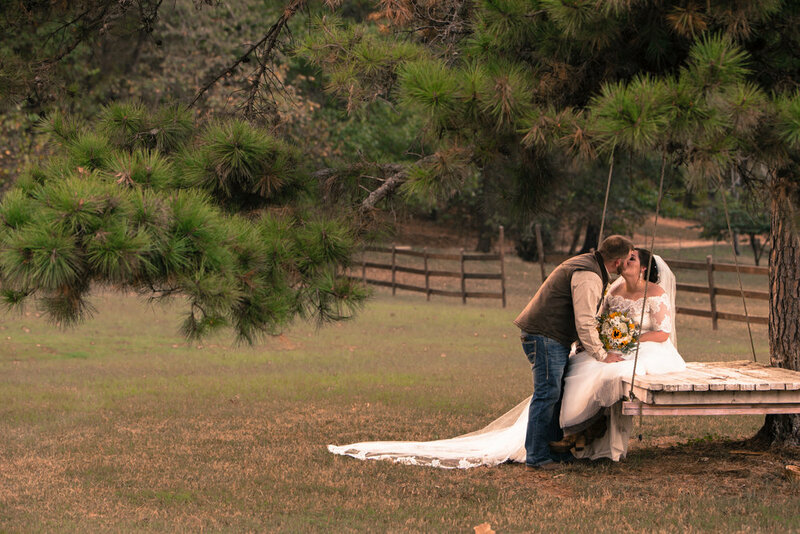 "I wanted a country chic fall wedding so the colors fell into place," Abigail said. Abigail's bridesmaids wore fun, flowy dresses with denim jackets and boots. The guys wore jeans, boots and tan shirts - a great look for a country, casual wedding! Few things are as happy and cheery as bright yellow flowers! These yellow and white bouquets would work for any season, and they're so pretty for a rustic, country wedding. 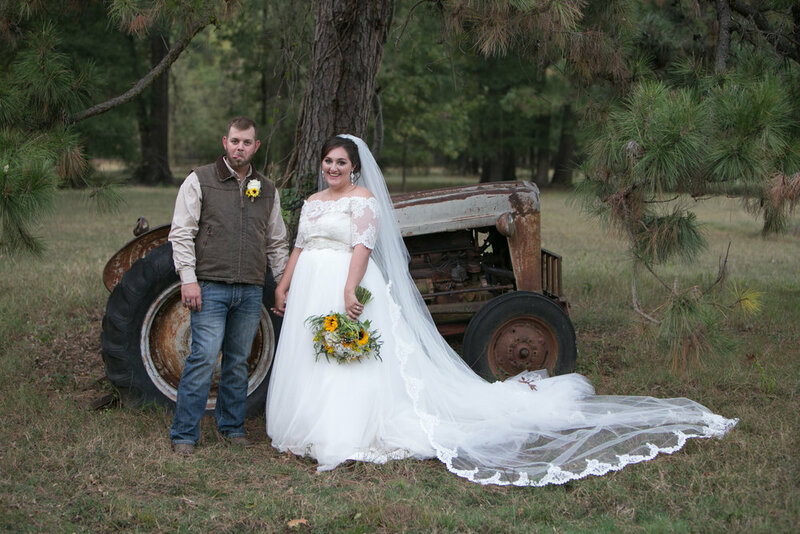 "All of them were gorgeous with beautiful sunflowers, white roses, greenery, and wheat wrapped with burlap with pearl pens," Abigail said. Abigail and Ben couldn't have picked a more gorgeous fall day to get married, and their ceremony details made a beautiful fall day even more lovely. All this yellow just makes me happy! 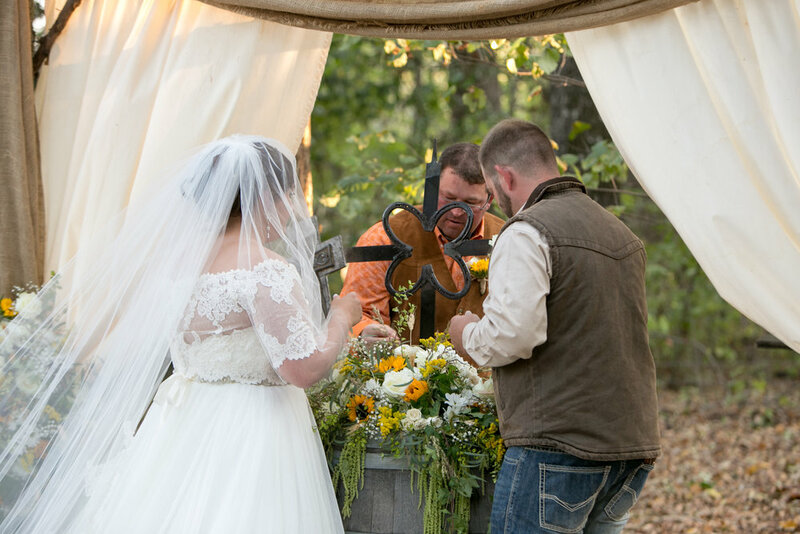 Their altar included an ivory drape, burlap, two yellow and white floral tiebacks, a whiskey barrel topped with florals, and their custom made unity cross. Their aisle was lined with logs topped with beautiful florals, and scripture from 1 Corinthians 13 painted on wood pieces. 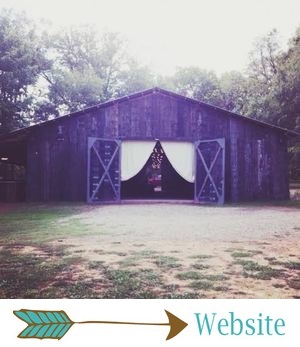 Truly the perfect country wedding! One of Abigail's favorite details of the day was their unity cross. "We made it ourselves and it meant more to both of us," she said. We very rarely see a bride who wears her veil over her face these days, but I'm totally loving it on Abigail. She was such a beautiful, classic bride! We're all about breaking tradition, but this was refreshing to see, and so, SO beautiful. Abigail and Ben chose not to have a first look, so all of their portraits were taken following the ceremony. They look incredibly happy and in love in these photos, and I'm just completely swooning over them! I mean, has an old, rusty tractor ever looked prettier, even with the hilarious face Ben is making?! 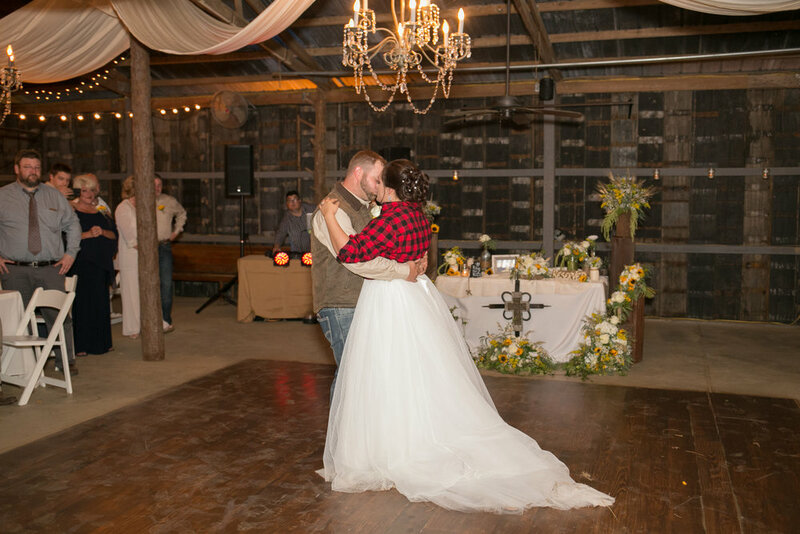 Abigail and Ben's reception was the DREAM country chic reception. 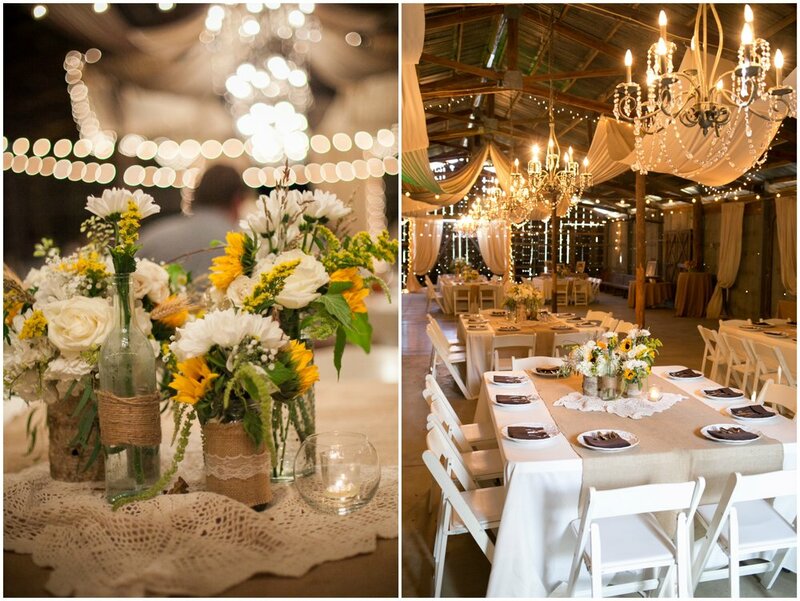 Their tables had white tablecloths, burlap, vintage lace, wood discs, and various jars, bottles and wood vases full of the prettiest yellow and white florals. Some of Abigail's favorite details from the reception: "Our memorial table with all of our loved ones, the cake topper was baby pictures of us, and the cowbell that said "Ring for a kiss,’" she said. Abigail's cake was unique and full of cute, country charm. The baby picture topper was an adorable touch! Ben had a chocolate cake, which was surrounded by deer antlers - manly, rustic and delicious! Glowstick grand exits are so fun! After their wedding, Abigail and Ben went sightseeing through Hot Springs on their way back home for a mini-honeymoon.